The Walking Dead, for those not aware, is based on the popular graphic novels by Robert Kirkman. In season one, Rick Grimes (Andrew Lincoln) awoke in a hospital to find out that while he was asleep, zombies have attacked his town, and the hospital he lies in. It soon becomes apparent that it’s not just his town, but the country itself that has been overrun by zombies with no apparent cause or cure. He joins a small group of survivors that travels from place to place looking for food, shelter and security. Along the way, their group changes in size for a variety of reason, including those taken by zombies. Since these are desperate times, they are forced to carefully consider allowing any new members into their group since no one can be trusted, while still tragically losing some of their own along the way. The zombies are slow but blood thirsty. For this show, standard zombie rules apply - they are attracted to sound and are best taken out by a bullet to the head. Since Rick is a police officer he quickly becomes the leader of the group. He travels with his wife Lori (now pregnant) and his young son Carl. There's also Carol, who recently lost her daughter Sofia, has become a tough member of the group and a friend to tough guy Darryl. Others include Hershel and his daughters who have joined the group and his oldest daughter Maggie is in a romantic relationship with a young man named Glenn. Andrea was a part of the group but has been lost, and is now presumed dead. Season three begins with no "previously on Walking Dead" type reminders. It jumps in right where season two left off. The gang searches a house finding only dog food and an owl to eat. Zombies are everywhere and the group must continue moving. They come upon a prison that’s full of zombies that were former prisoners and guards, but it looks manageable and it seems like it will provide the first sense of security anyone has had in a long time. While the prison does provides food and safety, it is also the scene where the group must deal with loss of life and limb. Andrea is not dead and has been barely surviving. Her traveling companion Michonne has figured out that she can create her own zombie body guard by cutting the arms and jaw off of a walker, allowing her to blend in with the undead. Andrea and Michonne happen upon a town called Woodbury where life is amazingly normal. The town’s governor has walled off the town, posted guards at every exit and the residents are able to enjoy picnics, bbqs, showers and even cold drinks. 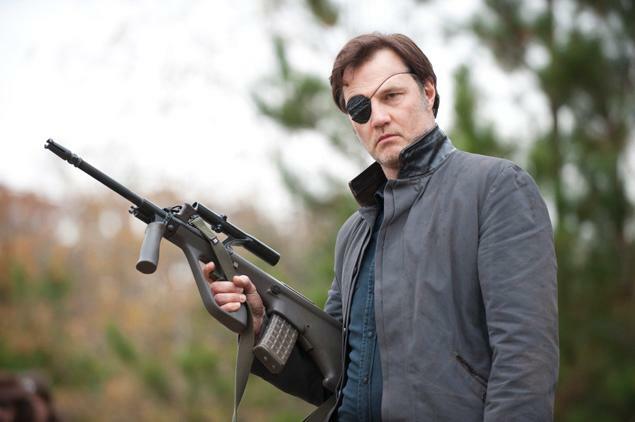 Life in Woodbury seems like a dream come true but the Governor has secrets and he isn’t the man he appears to be. 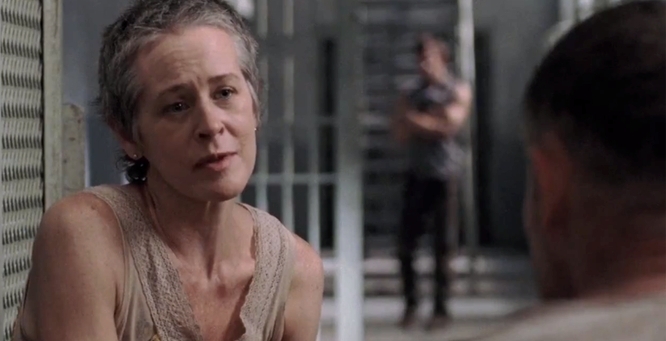 Michonne sees right through the Governor’s act but Andrea wants to believe. It doesn’t take long before the Governor decides for everyone in Woodbury that it’s time for war against the prison and its inhabitants. 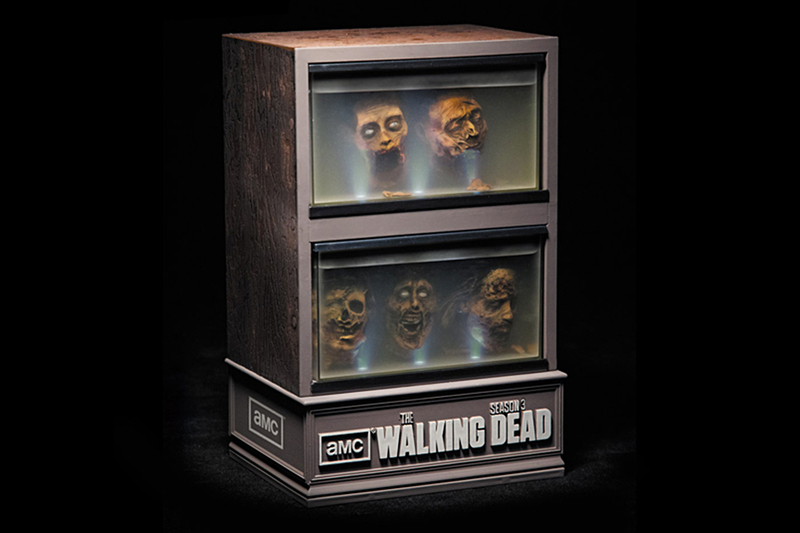 This season of The Walking Dead was released with both an optional limited edition “zombie head tank” designed by McFarlane toys and a traditional season set. 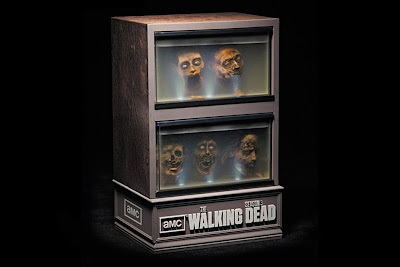 I was not lucky enough to become the proud owner of the zombie head tank, but I am happy with my Blu- ray set containing all sixteen season three episodes with numerous bonus features on the 5 disc set. While it may seem like a show that you can jump into at any point, I highly suggest watching seasons one and two first if you really want to understand what's going on. Season three starts with a very close group of family and friends traveling together so you need to understand how they relate to each other and how the friends met, how they got so close, and which members of the group are no longer with them. The Walking Dead is better than most zombie related films, new or old. Thanks to being on a weekly television show, it has the time to fully develop each and every character. While I do love Resident Evil, this show is not about some genetically engineered super hero fighting zombies with superhuman strength. It’s about everyone and anyone doing the best they can in the world they live in which happens to be overrun with zombies. There's no sacred cows in the show either, as some children die quickly while others pick up arms and hold their own with the bravest of adults. Families do their best to protect their loves ones but the odds are against them. Rick and his group of strays become closer than most families and it’s truly heartbreaking to watch members of the group die violent deaths that they do not deserve. 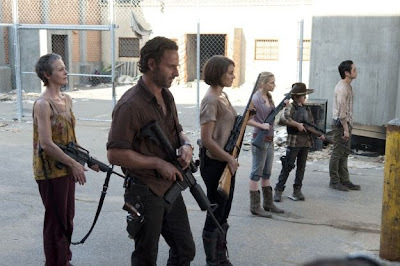 One of the best parts about The Walking Dead is that you never feel like anyone is safe. All it takes is one bite and everyone is vulnerable. Most of the cast are actors I’ve personally never heard of but three seasons in, I can't imagine anyone else in their roles. Season three contains some of the best acting I've seen, especially from Andrew Lincoln. He has a scene grieving for a loved one that is unbelievably authentic and heartbreaking. Each of the principal actors draws you in and keeps you on the edge of your seat. The show is well written, well acted and always leaves me desperately waiting for the next episode. The Walking Dead is horror as it should be. It’s violent and bloody but always for a reason, not just to make the audience cringe. 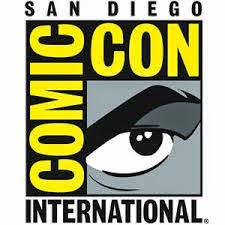 If you can’t stand the bloody stuff this definitely isn’t the show for you but if you do miss it, it’s a shame you’ll miss the drama and action that goes along with The Walking Dead. 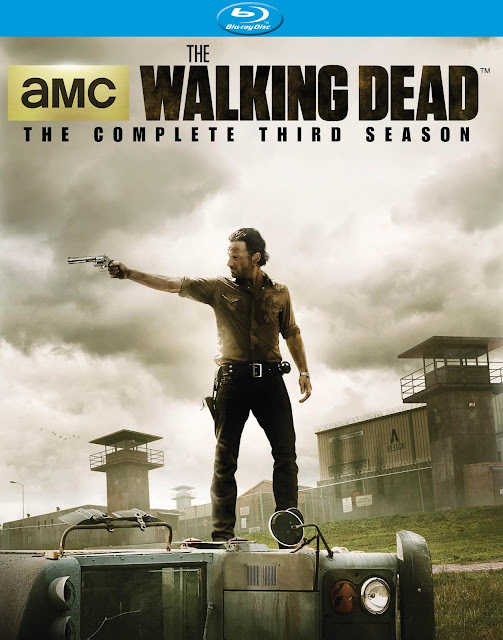 The Walking Dead: The Complete Third Season is rich and full of texture. It’s dirty and grimy and the viewer can almost feel the heat and the sweat as it pours down Rick’s face in any number of situations. The fine grain adds to the richness of the experience. Inside the dark prison and outdoors in the green fields the video presentation is excellent. Black levels and skin tones appear accurate and consistent and the Blu- ray does not disappoint. 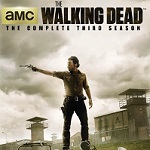 The Walking Dead: The Complete Third Season features an audio presentation that rivals the video. The soundtrack is exceptional. The show is full of gunfire from various weapons and all are unique and realistic. The zombies are chopped, stabbed, mutilated and shot and it’s as painful to hear as it is to watch. The prison is almost a character of its own and it is full of depth and drama. The dialogue is clear and intelligible during the loudest shouting and quietest whispers. Anchor Bay did not disappoint with this release. With the exception of the episode commentaries, the following features can be found on the last disc of the set. Audio Commentary – Audio Commentaries with cast and crew are available on the following episodes: Killer Within, Say the Word, Made to Suffer, The Suicide King, and This Sorrowful Life. Rising Son – A look at Chandler Riggs who plays Carl including casting and character development. Evil Eye – A featurette focused on The Governor who “rules” Woodbury and actor David Morrisey’s portrayal. Gone But Not Forgotten – A look at the death of a major character including on and off screen reactions. 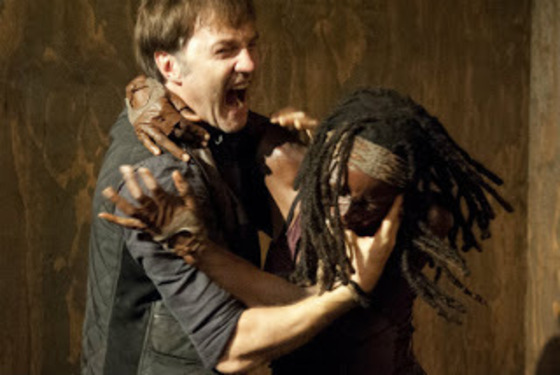 Michonne vs. The Governor – The conflict between the two characters is examined in this approximately five minute featurette. Safety Behind Bars – A discussion of the prison set. Making the Dead – A look at the visual effects and the creation of the zombies in their various stages of decomposition. Guts and Glory – An almost eight minute look at the death of more Walking Dead characters. Deleted Scenes – Deleted scenes lasting over thirteen minutes from “Walk with Me”, “Say the Word”, “Hounded”, “Home”, “I Ain’t No Judas” and “Clear”. The third season of The Walking Dead takes off from where season two left off and never loses momentum. It further explores the idea that during a crisis the survivors can be more dangerous than the undead. It’s dark, dirty, and depressing. It’s one of the few shows that deserves a whole show devoted to talking about it (AMC’s "The Talking Dead"). I’ve never watched an episode without wondering what I (would do. The zombie apocalypse brings out the best and the worst in people and The Walking Dead's third season is full of both. If fans of the previous seasons were hoping the show would finally lighten up, they will definitely be disappointed. The outlook is just as bleak and desperate and I can’t wait to see where season four will go. Most importantly in my book, the show is enjoyable after repeat viewings and I highly recommend the series, and this season.